One copy sold immediately. I have no idea how. But it did. Then my sister bought a copy. Then another sold. It wasn’t many, but hey, I did little to no marketing, so I figured the fact that any sold was good. And I must have been right about that. My children’s book is currently ranked at somewhere over one million on Amazon’s list. Every once in awhile, I’ll get a sale, and it’s like, hey cool, I almost forgot that was out there. But it’s been out for awhile, and I suppose that effects things. This collection practically started ranked at higher than 250,000, I’m guessing because of that first sale. I waited almost half a day to check on it after I found out I got the second sale. Just, didn’t think about looking. When I did, I was higher than 90,000. I wonder how high it had spiked if I had looked? Which got me thinking. If I could rise that high, with that few sales, there must be a whole lot on Amazon that isn’t selling. This idea gives me both hope and despair. Despair because there is a lot of stuff that isn’t selling. But hope that maybe, if you write something good, it can and will sell. Maybe if you do the right things, it is possible to be a best seller. So, I decided to enact a lot of advice that I’ve read. When you sign up with Amazon, you have the option of publishing just through them. This comes with several advantages: higher royalties, it get’s put in Kindle Unlimited, which doesn’t look as scary as it did at first, for now, and you get to use ‘free days’ or a countdown clock where the price progressively changes. You can pick one, and do it every 90 days. I picked the free one. I used up 2 of my allotted 5 days. The first free day I messed up. I was planning to promote it in Facebook groups. But, I was traveling the next day, and wound up staying up late to do things like pack and clean. I got about 4 hours of sleep that night, and spent the whole next day in transit. I didn’t even look at Amazon until almost midnight. And I was #8 in my category. I was so very surprised. I guess people like free. I promoted it that night the way I had planned to the first day. Categories are also important. Make sure you’re in the right one, and keep an eye out for how many other books are also in it. The second day saw a smaller amount of downloads, but combined, it was enough to push me up to #6. I know I know better. I know that these numbers aren’t as significant as they seem. 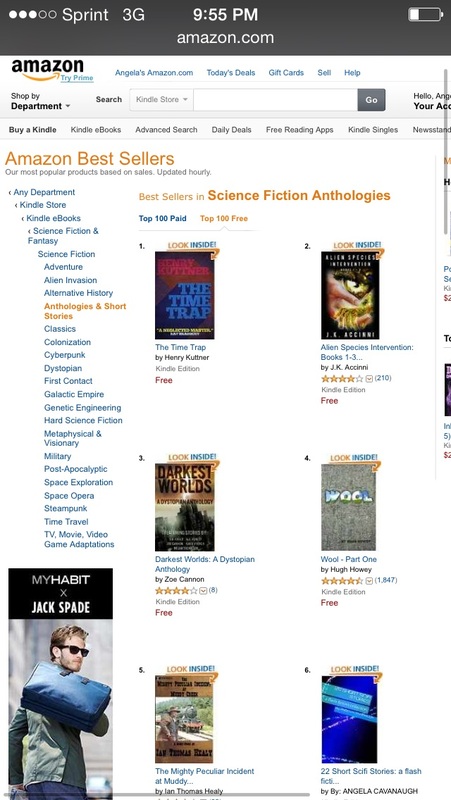 But, it made me really excited to see my name, my stories, in a top 10 on Amazon. I was 2 down from Hugh Howey’s Wool, and you all know how I feel about him by now. It felt like being an extra, maybe the kind with lines, in a movie featuring Emma Stone or something. Where you know you’re not nearly as important or achieved, but you can see yourself getting there, and, hey, you’re sharing screen time. So I was, and continue to be, excited. The metrics might be different once the free days officially end. But making money on this one wasn’t the point. Sure, it’d be great if it happened. But this was a learning experience. Free days are a good thing. They got more people reading my stories than may have otherwise. And that’s the point. To get people reading. To get reviews (hopefully some show up). To get my name out, maybe make a few new fans, invite them to check out this blog, and hopefully, if they like what I’ve done, then they’ll like the next thing, too. And even the ones after that.